2. I have been requested by the Waubra Foundation to undertake a review of the draft guideline. 3. This submission relates to the acoustic component of the guideline which is not based on factual material related to wind turbines, nor will it protect residents from adverse impacts. 4. If the draft noise guidelines are implemented, then as has been experienced in other states of Australia, the Queensland Government will be permitting wind farms to create adverse impacts on residential premises in proximity to the wind farms. 5. This submission relates to my experience in the monitoring of noise emissions (both audible and inaudible) that I have conducted in relation to wind farm projects in Australia. 6. The matter of health impacts is outside of my professional expertise. However, I am aware from my consulting practice of the relevant noise and vibration standards that identify criteria which are required to protect the health and well-being of the community and work force. I am aware that ongoing sleep disturbance is classified as an adverse health impact and am aware first hand of advice from residents in proximity to wind farms on ongoing sleep disturbance and a range of other adverse impacts. 7. The fundamental issue with the draft guidelines is that the noise criteria is in dBA, and is not based on social surveys or social-acoustic surveys of residents impacted by wind farms. Therefore, the suitability of the criteria has not been established. 8. Currently in Australia wind farm assessments are undertaken by reference to the South Australian wind farm guidelines or New Zealand Standard NZS 6808. Both documents refer to criteria issued by the World Health Organisation without acknowledging that the studies undertaken or referred to by WHO relate to road traffic noise in urban areas and not wind turbines in quiet rural areas. The WHO criteria for road traffic identifies that where the noise in a residential dwelling has a predominance of low-frequency noise, the criteria should be reduced. 9. There have been three Australian Federal Senate Inquiries into windfarm noise and adverse impacts, and each Inquiry has noted that in Australia there are no studies that have identified the ambient noise environment in rural areas, nor studies to identify what is an acceptable acoustic amenity for residents in rural areas in Australia, where the ambient noise levels are significantly lower than that in urban areas. 10. The draft guidelines have failed to identify that the nominated criteria in relation to industrial wind turbines is not supported by any social surveys, combined with medical studies to identify a dose-response curve for acceptable levels from wind turbines. 11. The draft guidelines have failed to identify the numerous complaints lodged by residents in proximity to wind farms including sleep disturbance out to at least ten km, and the absence of any full spectrum investigations into addressing the complaints. 12. The draft guideline has failed to refer to the results of the comprehensive acoustic investigation at Cape Bridgewater. 13. There are errors in a number of the references used as a basis for justification of the draft Queensland Code Planning guideline, when compared to the actual field measurements of wind turbine noise at Cape Bridgewater and Waterloo. The noise impact assessment methodology provided as Appendix 4 to the proposed Queensland Planning Guideline does not identify the objective of the guideline or what is an acceptable acoustic impact. The core objective of the guidelines is to balance the advantage of developing wind energy projects in South Australia with protecting the amenity of the surrounding community from adverse noise impacts. The SA EPA Guideline identifies sleep disturbance is an adverse impact for hosts, but does not define what constitutes an adverse noise impact from wind turbines upon which noise limits have been established. The SA EPA Guideline does not identify what is the existing acoustic amenity of rural residents and how the guideline protects the amenity of the surrounding community. The SA EPA have advised the Waterloo wind farm is compliant with the SA guidelines. However, residents in proximity to the Waterloo wind farm have identified the wind farm creates adverse impacts and therefore have identified that the criteria contained in the SA EPA guidelines do not meet the core objective. This Standard is intended to avoid adverse noise effects on people caused by the operator of wind farms while enabling sustainable management of natural wind resources, This can be achieved through resource planning measures to address the management of effects of wind farm sound on noise sensitive activities. As in the case of the SA EPA Guideline, the NZ Standard does not define what constitutes an adverse noise impact from wind turbines, upon which noise limits have been established to ensure there is no adverse impact. The same situation arises in the Queensland draft guideline that there is no material contained in the draft guideline to identify what is an acceptable acoustic impact and at what noise levels will there be no adverse impact. Copying inadequate guidelines from the SA EPA or the New Zealand Standard that do not achieve the stated objective/intent would not appear to be an appropriate starting point. The title of Appendix 4 of the proposed Queensland Planning Guideline is “Noise impact assessment methodology”. However, on viewing the Appendix there is no identification of how the impact is assessed. Appendix 4 provides a mechanism for determining noise emitted from a wind farm but provides no procedure for determining the impact. The operation of wind farms, besides creating noise that may or may not be audible, have been reported by residents around the world as creating impacts that do not occur when the wind farm is not operating or the residents are removed from the site of the wind farm. The matter of identifying the impact that will occur as a result of a wind farm project is a critical factor for the community. If one is dealing with the acoustic aspects of a wind farm, then the acoustic report needs to consider audible and inaudible sound both in the normal range of hearing and also the area of hearing that is below 20 Hz, that is normally identified as infrasound. The acoustic assessment should also identify that the character of the noise when perceived at residential receivers may contain audible characteristics that render the A-weighted level of no assistance. The “Noise impact assessment methodology” needs to explain to the community the impact that the proposed wind farm project will have upon the existing acoustic environment of the area, and whether the operation of the wind farm project will affect their daily activities or their night time sleeping patterns. Complaints from residents in proximity to wind farm projects frequently refer to sleep disturbance, in addition to symptoms and sensations they experience during the day. This is not an exercise required in the stated methodology, but simply reliance upon criteria issued by other states in Australia that are subject to the same fundamental flaw. The general argument provided in relation to windfarms is that there are no studies to show there is an impact as a result of the operation of the wind farm. The counter and relevant argument is that there are also no studies to show that there is not an impact as a result of the operation of the wind farm, simply because there are no such studies. As identified by the ERD Court in South Australia (in relation to the Stony Gap Wind Farm, the acoustical consultant representing the Applicant relied upon the fact that the responsibility in that state for protecting the amenity of rural residents lies with the South Australian EPA. The ERD Court formed the view the EPA had determined satisfactory guidelines for wind farms that would protect the residents and therefore were bound by those guidelines. However, the EPA have not provided the basis of their guidelines in terms of rural residents and the impact of wind turbines. On the contrary there is a clear failure by that EPA to demonstrate their criteria adequately protects residents. On page 31 of the Planning Guideline under a heading of “Potential adverse characteristics” there is a claim of that excessive low frequency noise, tonality, impulsivity or ‘enhances amplitude modulation’ may be described as potential adverse characteristics of wind farm noise emission but claims such characteristics are atypical. One only has to go to the published material as to tonality of the gearboxes at Hallett wind farm and Glen thompson wind farm, the yaw brake screeching at the Cape Bridgewater wind farm and the low frequency noise complaints from the Capital, Gullen, Waubra, Waterloo, Hallett and Macarthur wind farms to identify that such characteristics are not atypical. The use of an A-weighted level, that automatically by the way of that filter curve reduces the impact of low frequency noise, presents in terms of real-world application a biased presentation. When sound travels over distance the attenuation occurring in the high-frequency region is significantly different to that in the low-frequency region thereby resulting in an imbalance in the spectrum at receiver locations compared to locations near the turbine. Page 32 of the Planning Guideline identifies the difference between and outside and an inside measurement where the high frequencies are attenuated by the building envelope. The material in relation to dB and the cited paper of the Health Canada report is incorrect. The claim of limits of 60dBC at night and 65 dB in the day for a range of devices are not from wind farms. Figure II shows that above 35 dB(A) just over 10% of the population were highly annoyed. Using Figure 1 in the paper as reference 2 it can be seen that as an outdoor level the 35 dB(A) value relates to 55 dB(C). The comments about tonality on page 32 are incorrect as can be attested by residents in proximity to the Hallett, Glen Thompson and Cape Bridgewater wind farms that were subject to testing by acoustical consultants for the wind farm operator and found to comply with the permit conditions. The occurrence of wind gust that excite the resonant modes of the turbine blades/towers give rise to an impulse signal both in the ground and the air, as has been previously identified for the Macarthur and Cape Bridgewater wind farms (Les Huson & Associates) and confirmed in my Cape Bridgewater study. Enhanced Amplitude Modulation occurs and is the subject of further study. In a recent paper to the Acoustical Society of America I examined the UK method of assessing modulation with respect to the infrasound signature recorded at Cape Bridgewater and found a relationship. The dB(A) criteria commencing on page 33 would be correct if the limits were expressed for the day as 37 dB(A) or the background noise (LA90, day) by more than 5 dB(A), whichever is the lesser, for all integer wind speeds … . And similar for night the limit should be 35 dB(A) or the background noise (LA90, day) by more than 5 dB(A), whichever is the lesser, for all integer wind speeds …. There is a fundamental issue with the background level used in the guideline in that it does not agree with the procedure for other industrial noise sources, and the method proposed in the guideline proposes to permit an adverse impact by have noise levels much greater than the ambient background. The paper on the Health Canada study, identified as reference 2 in Appendix 4 of the Planning Guideline, presented a dose response curve for wind turbines. It is necessary to note that a large proportion of the respondents in the Canada Health study are in semi-urban areas where the ambient background level is higher than in rural areas. Prior to the Health Canada study, it would appear that the only dose-response curves available for wind turbines relate to 2 studies in Sweden and one in the Netherlands (occurring more than 12 years ago) that had a limited data set and did not separate rural areas from urban areas. Those studies did not actually measure the wind turbines but utilise predicted levels obtained from computer modelling. As the recent Senate Inquiry into wind farms has heard, determining the actual A-weighted contribution of wind turbines at rural residences presents some difficulty. An analysis of the three aforementioned studies and separating the respondent groups into rural and urban environments reveals different noise criteria would apply in those studies that would suggest lower noise levels than that nominated in guidelines (used in Australia), that as identified above are based upon road traffic noise. 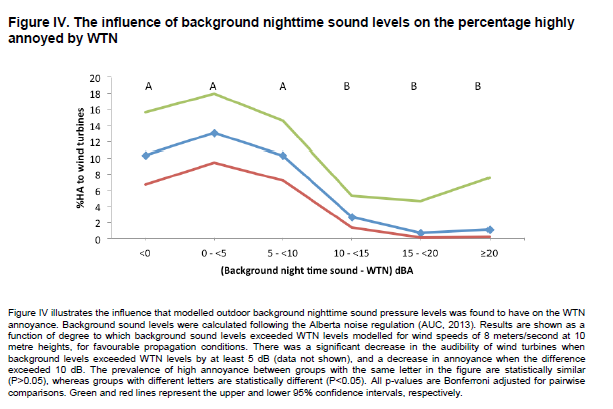 As to the impact of noise in rural environments (or low ambient levels) on going to page 13 of reference 2 in Appendix 4 it can be seen that the annoyance of wind turbine noise was statistically higher in the summer, outdoors and during evening and night time. If one tends to have windows closed in the cooler months (assuming Canada is much colder than Queensland) then the change in annoyance should be obvious. The last paragraph on page 13 of reference 2 nominates the night the annoyance significantly dropped in areas where the calculated night time background noise exceeded the wind turbine noise by 10dB or more. A somewhat convoluted statement that is presented in a different format to that normally used in Australia for determining a noise exceedance. The reference reveals that in terms of annoyance where the turbine noise is less than 10 dB below the background level then the annoyance drops off significantly. The following figure is from page 14 of reference 2 to Appendix 4. If one is looking to a criterion to protect 90% of the population then using the blue line for night time operations the limit should in fact be no more than the background level, because 5 dB below the background is still audible and 10 dB below the background is not that annoying. The following figure suggests that in terms of masking that wind turbines and more annoying than general sources. 77. The reference paper does not identify just how Figure 5 affects the 10% threshold for the general population result of 35 dB(A) limit. Historically traffic noise and aircraft noise criteria have been based on scientific studies that utilised socio-acoustic studies where there are acoustic parameters/measurements and community response established/obtained by proper scientific methods resulting in the use of a dose-response curve with criteria generally set to protect 90% of the population 90% of the time. The paper of the Health Canada study confirms earlier work by Pedersen (Pedersen e, van den Berg F, Bakker R & Bouma J, Response to noise from modern wind farms in The Netherlands J Acous. Soc. Am 126 (2) August 2009) pp 634 -639) that noise criteria for wind farms should be lower than that for road, rail and air traffic. For example, the 35 dB(A) limit for 10% of the population provided in reference 2 to Appendix 4 is significantly lower than the Leq limits of around 55 dB(A) for road and air traffic and should for persons appropriately trained in acoustics to be cautious of adopting general environmental acoustic criteria for wind turbines. For example, the New South Wales EPA in their Industrial Noise Policy specifically state that their background + 5 dB(A) limit is designed to protect 90% of the population 90% of the time. In the case of aircraft noise as assessed in Australia I note that aircraft noise is an audible noise, the fundamental planning criteria is not based on a dB(A) but uses the Effective Perceived Noise Level (“EPNL”) which is an international criteria based on determining the loudness of an aircraft fly over by reference to the different response curves of the human ear and takes into account tonality to the aircraft noise and the duration of the event. It is acknowledged that road and rail traffic utilise the general dB(A) criteria based upon an energy average method but still referring back to dose-response curves. In relation to the background level nominated in the draft guideline the regression line that has been nominated is not the true background level and cannot be the basis of providing criteria to protect 90% of the population for 90% of the time if the regression line represents 50% of the L90 measurements when separated into integer wind speeds. So as to be consistent with other industrial noise sources and taking into account the acknowledgement that the background level varies with the wind strength then industrial wind turbines should be established on the basis of background +5 dB(A) where the background level is the statistical L 90 of the ambient noise across the different hub height wind speeds. As wind is recorded over two years for the purpose of obtaining data for a wind farm application there would appear to be a significant limitation in using only two weeks of noise data to determine the ambient noise measurements conduct occurred at reference locations that are considered relevant or appropriate for general receiver area. The ambient noise monitoring must have a minimum of three months of monitoring that would then permit the statistical L90 levels to be determined for each wind bin (when segregated into 0.5 mm/s values) to derive valid L90 background levels (see Annexure A). Page 47 of the planning guideline refers to management of potential exceedances of criteria but not the creating of adverse impacts. As noted above the South Australian EPA guidelines identified that excessive noise should not occur, but does not provide a definition or basis of excessive noise other than indicating sleep disturbance for hosts is excessive noise. To address the inadequacies of excessive noise, the first limit for excessive noise from turbines (as a contribution) is to use a limit of the true L90 background regression curve +10 dB that is exceeded for more than 10% of the time in any two-week period. The second limit is the noise from the turbines (as a contribution) above 30 dB(A) inside bedrooms that is exceeded for more than 10% of the night time period over any two-week interval. The planning guideline ignores infrasound which is readily measured if one has the appropriate instrumentation. It should be acknowledged that the levels generated by wind turbines are inaudible at residential property but that the presence of an infrasound narrowband signature associated with the turbine blade pass frequency and multiple harmonics is present when the turbines are operating. Infrasound has been ignored by environmental authorities on the basis that such levels are considered to be well below the threshold of hearing. However other than the Kelley work in the 1980s and the Cooper work in 2014 have been no other attempts to identify the dose response for the infrasound signal associated with turbines. The use of the dB(G) or 1/3 octave band measurements to examine infrasound does not, by way of a South Australian EPA study show any difference in the natural environment by reason of those parameters, whereas use of narrowband measurements identified in various studies around the world, including in Australia the Waterloo windfarm assessment by Adelaide University, The Acoustic Group and Les Huson & Associates, and the Shirley windfarm and Health Canada infrasound study all show the unique and distinct infrasound signature from turbines when using narrowband analysis. Whilst an appropriate dose response for the infrasound signature has not been determined at this point in time, as a precautionary principle, utilising the levels at which residents in the pilot study at Cape Bridgewater abandon their homes then an internal limit of dB(WTS) or technically the more correct Ls (WT) should not exceed 51 dB. Real-time monitoring of noise emission from a windfarm in terms of A-weighted levels and narrowband infrasound is both practical and feasible to measure at the permitter of the windfarm and was a recommendation of the Senate Inquiry into excessive noise from wind farms, with even representatives of the wind industry agreeing with such requirements. The matter of compliance with the relevant criteria applicable the windfarms is required to be transparent and as identified by the Labor Senator in the recent in Wind Farm Inquiry there needs to be independence in such monitoring and presentation of data. The draft guideline does not provide any basis to show the nominated limits will protect the amenity of rural residents in Queensland nor ensure there will be no adverse noise impacts. The draft guideline repeats the same errors of the South Australian EPA wind farm guidelines – although in this case there is no attempt to provide an objective of the guidelines with respect to the amenity of rural residents. The draft guidelines do not provide any material to identify the existing noise amenity experienced by residents and does not provide any survey data to identify what is an acceptable noise from turbines in such an environment. Appendix 4 of the Planning guideline identifies a methodology to determine the noise impact. Yet at no point in that Appendix is the basis of identifying an impact provided. Appendix 4 provides criteria and a methodology that permits noise levels similar to that in South Australian and Victoria that create excessive noise, creates adverse noise impacts and causes some residents to abandon their homes. The noise criteria proposed in the draft wind farm sate code is most likely not protect residents for their health and well-being and will not protect their environmental values. A reasonable person could form the view the Queensland draft guidelines have been prepared by or for the wind industry. This has happened elsewhere by using acoustic consultants who work closely with the wind industry being involved in writing the noise pollution guidelines – starting with ETSU 97 in the UK many years ago. ETSU 97 is the basis for all current Australian Wind Turbine Noise guidelines and the NZ Standard. The advice from Dr Antoine would obviously be presented to any appeals or nuisance action pertaining to noise from the operation of a wind farm in Queensland. The proposed criteria utilise a background methodology that is different to all other industrial noise sources, even taking into account the increase in background level as a result of the wind. So as to be consistent with other industrial noise sources and taking into account the acknowledgement that the background level varies with the wind strength, then industrial wind turbines should be established on the basis of background +5 dB(A) where the background level is the statistical L 90 of the ambient noise across the different hub height wind speeds. As wind is recorded over two years for the purpose of obtaining data for a wind farm application there would appear to be a significant limitation in using only two weeks of noise data to determine the ambient noise measurements conducted at reference locations that are considered relevant or appropriate for general receiver area. The ambient noise monitoring must have a minimum of three months of monitoring that would then permit the statistical 90 levels to be determined for each wind bin (when segregated into 0.5 mm/s values) to derive valid L90 background levels. As rural environments experience ambient background levels significantly lower than that experienced in urban environments, the dual criteria currently expressed in various windfarm guidelines used in Australia should stipulate a contribution not exceeding 37 dB(A) in the day, 35 dB(A) at night, and background +5 dB(A) whichever is the lower of the criteria. This concept would accord with the material contained in reference 2 to Appendix 4 of the planning guideline that shows the annoyance of turbines at night is also related to the difference between the ambient background and the wind turbine contribution. This concept would accord with the intrusive/amenity principle used by the New South Wales EPA but acknowledging the reality of low ambient background levels that occur in rural environments and not the inadequate “default” background level of 30 dB(A) currently used by the NSW EPA. The South Australian EPA guidelines identified that excessive noise should not occur, but does not provide a definition or basis of excessive noise other than indicating sleep disturbance for hosts is excessive noise. On the matter of infrasound, it should be acknowledged that the levels generated by wind turbines are inaudible at residential property but that the presence of an infrasound narrowband signature associated with the turbine blade pass frequency and multiple harmonics is present when the turbines are operating. Infrasound has been ignored by environmental authorities on the basis that such levels are considered to be well below the threshold of hearing. However, there is evidence that infrasound at such levels can still be perceived and can cause sensations which can be severe enough for some residents to choose to vacate their homes. Other than the Kelley work in the 1980s and the Cooper work in 2014 there have been no other attempts to identify the dose response for the infrasound signal associated with turbines. The matter of compliance with the relevant criteria applicable the windfarms is required to be transparent and as identified by the Labor Senator in the recent in Wind Farm Senate Inquiry, there needs to be independence in such monitoring and presentation of data. Real-time monitoring of noise emission from a windfarm in terms of A-weighted levels and narrowband infrasound is both practical and feasible to measure at the perimeter of the windfarm and was a recommendation of the (previous) Senate Inquiry into excessive noise from wind farms, with even representatives of the wind industry agreeing with such requirements. Posted on: 13 December 2015 . Category: Acoustics, Government Inquiries. Tags: Cape Bridgewater Acoustic Study, Noise Assessment Procedure, Qld Wind Farm Guidelines, SA EPA Wind Farm Guidelines, Steven Cooper, The Acoustic Group.